many other notable artists, will be exhibiting in the Riverchase Loves Artists show, Feb. 4 at the Riverchase Country Club. Journal photo by Jordan Wald. Life isn’t what it used to be for Paul Ware. Before having a brain hemorrhage in October 2014, Ware was a busy mergers and acquisitions attorney at Bradley, a nationwide law firm based in Birmingham. The neurological event affected the motor functions on Ware’s left side, leaving him with limited use of his left hand and arm. But despite the physical limitations, he says life now is better than ever. Sponsored by the Riverchase Women’s Club, the 11th annual Riverchase Loves Artists will feature about 50 notable artists exhibiting and selling work in a variety of mediums, including oil and water- color paintings, jewelry, metal, wood, pottery and fiber art. “I know it’s a crazy thing to say, but it’s true,” he said. Ware retired at the end of 2015. So now instead of spending long hours in a downtown office, which he did for 30 years, he spends his days painting at the Rosedale studio he shares with leather artist Becky Stayner. 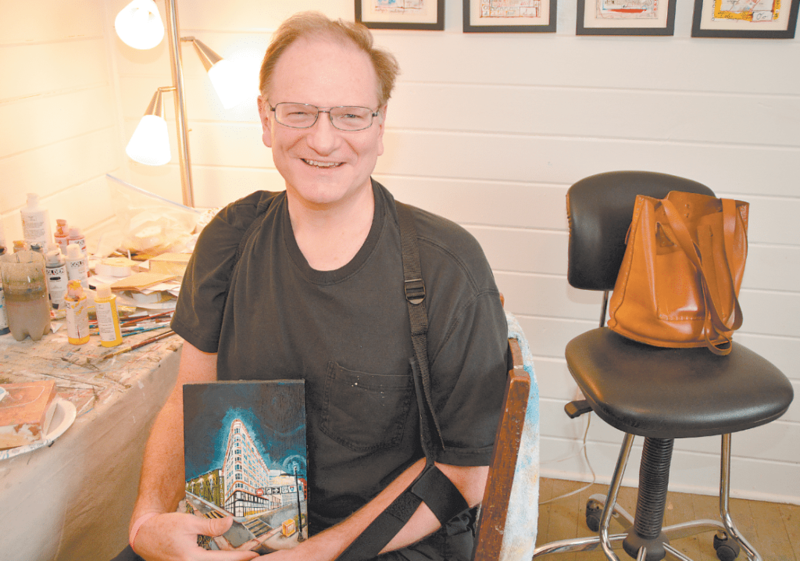 It was Stayner, in fact, who suggested that Ware become an exhibitor in the upcoming Riverchase Loves Artists show, Feb. 4 at the Riverchase Country Club. Inspired by a combination of visual, political and humorous concepts, Ware prefers to paint on hard surfaces as opposed to canvas, using birch panels or pieces of copper, tin or other sheet metals as the foundations for his work. Ware’s paintings often feature the contrast and sharp edges of architectural elements against the softness and warmth of nature – like a garish billboard against a bucolic landscape or the geometry of high tension power lines and towers against a beautiful sky. “I also like night scenes lit by artificial light,” he said. Though Ware has been pursuing art in one way or another since his junior high days, it wasn’t until the 1990s, during a particularly busy time at the office, that he set up a studio and began producing a body of work. 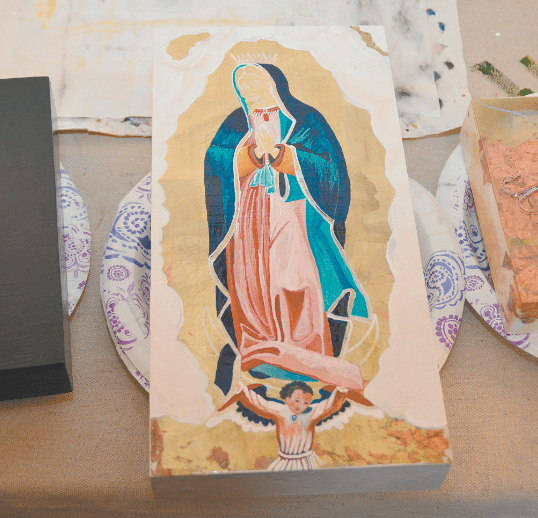 Though what Ware refers to as his “new normal” has required adjustments – he’s had to learn how to paint with one hand, and his paintings are smaller now – it has in no way deterred his desire to continue pursuing his art. Sponsored by the Riverchase Women’s Club, the 11th annual Riverchase Loves Artists will feature about 50 notable artists exhibiting and selling work in a variety of mediums, including oil and watercolor paintings, jewelry, metal, wood, pottery and fiber art. The show is open to the public for a $2 donation. Proceeds from the sale will benefit several charitable organizations. A shuttle will be available to take people from the parking area to the clubhouse. For more information, visit riverchaselovesartists.com.